High Country News and Investigate-West collaborated on an article titled “Fishing reform drives inequality in Alaska”. This article provides a local fisherman’s perspective of how the Alaska Individual Fishing Quota Halibut and Sablefish Program has negatively impacted the economy of tribes in Kake, Alaska. The author interviews Henrich Kadake, the mayor of Kake and a board member of the tribal corporation. He has lived in Kake most of his life and has seen how reform has caused economic inequality to grow over the years. Fishing had historically been the main source of work in the area. Prior to the program implementation, the area was known for its chaotic and unsustainable halibut fishing seasons. In 1995 the National Marine Fisheries Service created the catch-share program to award a permanent allotment of halibut fishing rights, based on historic catches, to a limited number of boat owners. Because of this, fishermen with quota allotments were then able to fish for longer seasons. This provided more flexibility to go out in safer weather and deliver fresh fish regularly rather than annually. 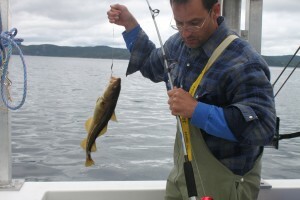 Each quota-holder is allowed a certain percentage of the total catch. Each year the feds re-assess the halibut population and determine what that total catch should be. The quota program was intended as an incentive to keep fish populations healthy and to advance conservation and economic goals. 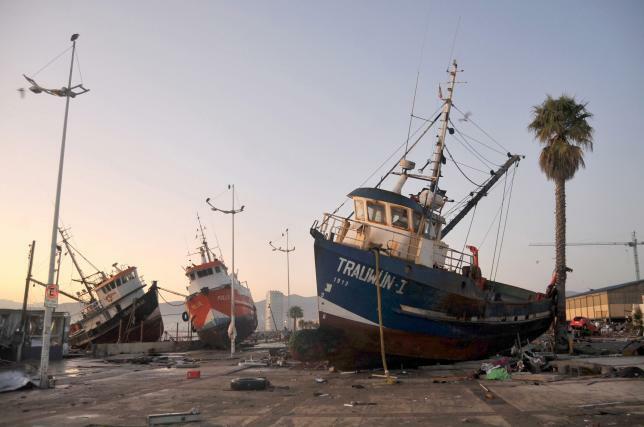 Yet as a result the local fishing economy has experienced a severe decline. Over the last five years, the village’s population has dropped by half, to 500, as people leave to seek work elsewhere. However, another coastal town, Petersburg, lies just fifty miles southeast. In contrast, Petersburg, is a predominantly white, wealthy, fishing community who has continued to prosper since the reform. The economic hardships of Kake were a result of several variables including rural isolation, harsh winters, a lack of cash flow, poor fishing infrastructure, and a dramatic spike in fuel prices. All of this prompted many locals to sell their quota to fishermen in other towns, such as Petersburg, in order to pay for basic necessities such as heat and food. When the program began, forty-two Kake fishermen owned halibut and sablefish quota. As of 2012 only nine did. 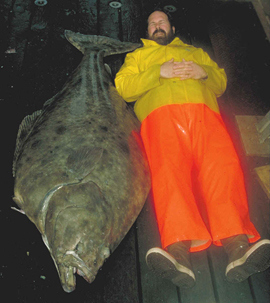 Kake’s share of the catch dropped from 277,256 pounds of halibut to 64,053 pounds. The community is currently advocating for a $40 million federal project that would help to build better roads for improved access to other towns, and a local hydroelectric power plant that could provide affordable, local, power. This case study is an example of how there is a complicated marriage linking fisheries and economics. It is important to take into account systemic disproportionate economic advantages, access, and opportunities between stakeholders when planning policy and programs in order to minimize any negative unintended consequences. Chile is Ready for Coastal Earthquake Hazards, Are We? Chile is no stranger to earthquakes, on September 16th Chileans experienced their third quake over magnitude 8 since 2010. The quake was paired with a tsunami which hit the Chilean coast (and triggered warnings along large portions of the California coast as well) resulting in a remarkably low death toll, and minimal damage to property. How did the coastal communities of Chile manage to absorb the consequences of these hazards so well? The New York Times, reporting on the event (in an article titled “Why Chile’s Latest Big Earthquake Has a Smaller Death Toll”) found that while Chile’s success was in part geographic and geologic luck, preparation and planning for resiliency were substantial factors in reducing the magnitude of the disaster. Chile learned from past experiences (such as the 1960 Valdivia earthquake) the importance of preemptive measures (such as building codes) and has since implemented standards (similar to what we have in California) that today make the country much better prepared for disaster events, such as the earthquake and tsunami experienced last week. Chile also prepares for disasters by practicing earthquake drills with coastal communities and improving emergency response and warning systems. 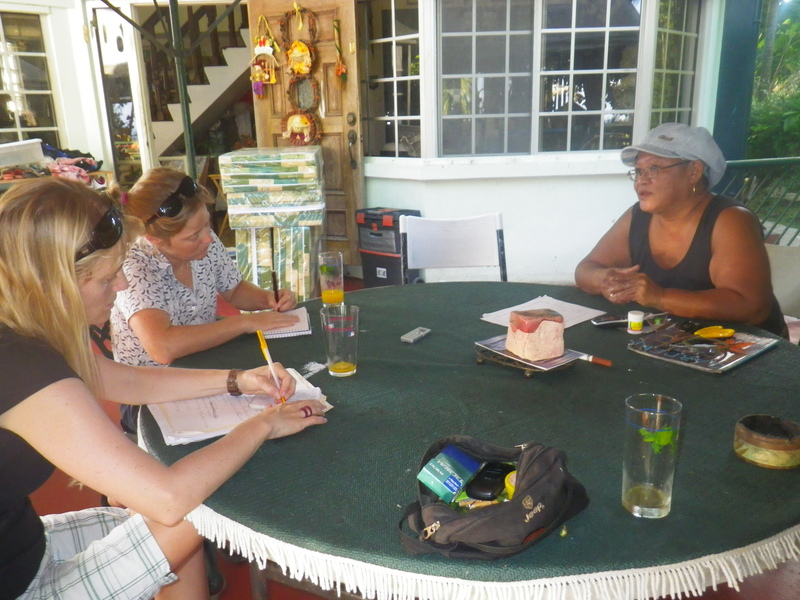 Chileans are alerted quickly and know exactly how to respond when an earthquake or tsunami strikes. 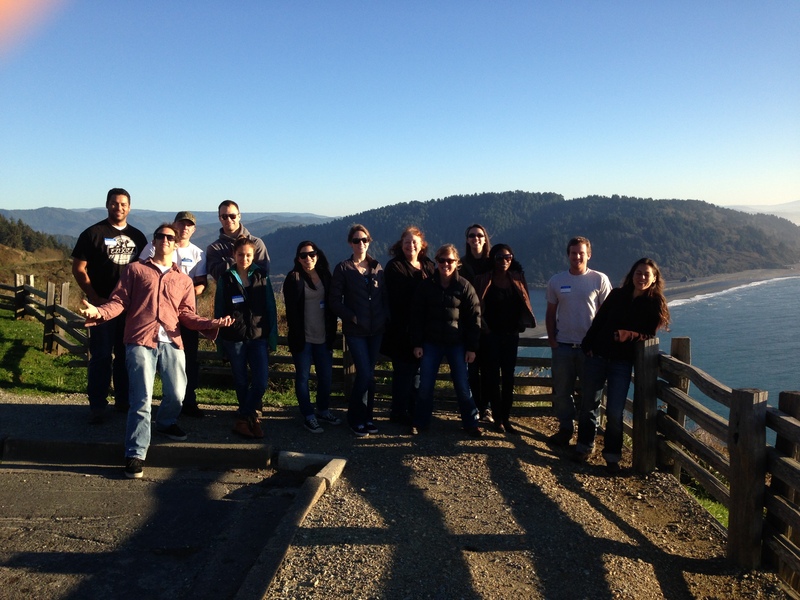 As Coastal & Marine Planning students, we wonder how Humboldt County would hold up to large seismic activity and an accompanying tsunami. We need to plan for numerous hazards that would be triggered by a magnitude 8+ earthquake, beyond the event itself. For example, a tsunami wave is a major concern for the coastal towns Manila and Samoa. 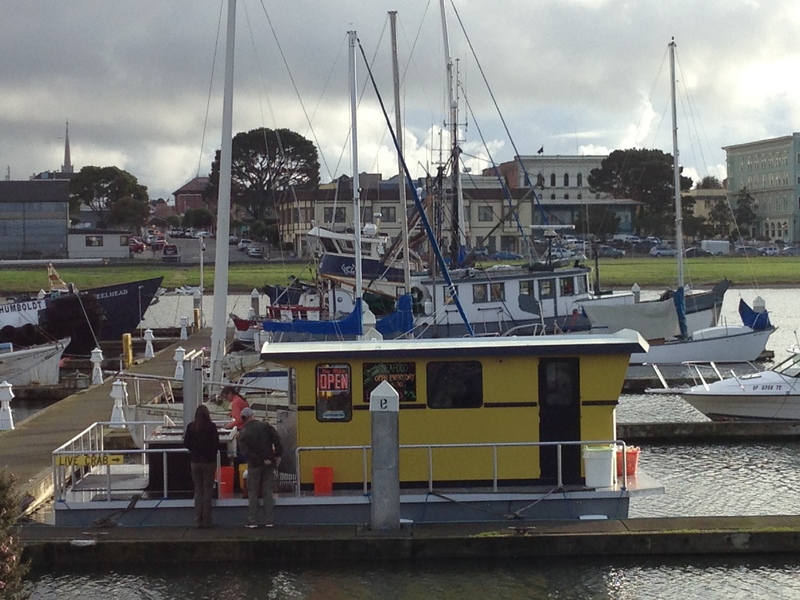 Aldaron Laird has identified levee breaches that are a major concern all along the coast of Humboldt Bay. Landslides along the 3 roadways into the county could effectively cut us off from the rest of the state, making it difficult to evacuate or have outside help sent in. Various forms of infrastructure, including wastewater processing facilities, power generation facilities, hospitals, water treatment plants, a fuel depot and a decommissioned nuclear power plant would potentially be inundated and destroyed. Although no one knows when the next big earthquake will hit Humboldt County, there are plans in place which have been developed by the County’s Office of Emergency Management to help us get through future natural disasters. You can view Humboldt’s Emergency Operations Plan here, or check out the various contingency plans for different events here and decide for yourself – are we ready? It is common knowledge that climate change will bring about new and potentially irreversible impacts to many coastal communities throughout the nation. 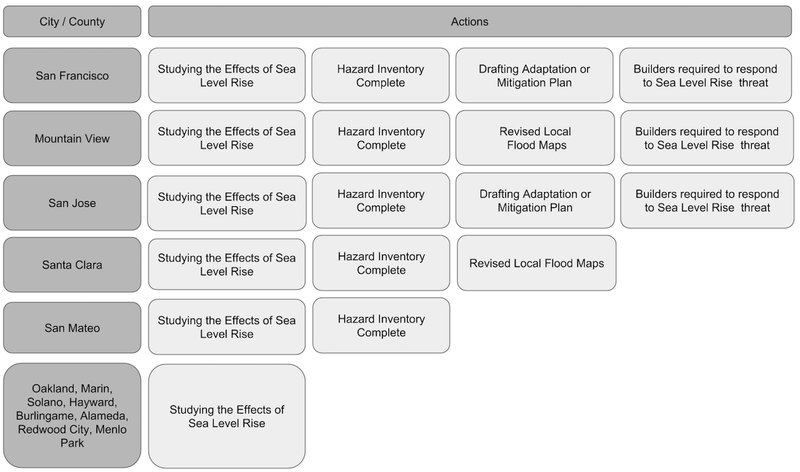 Climate science proves that coastal communities are vulnerable to sea level rise (SLR), however, many counties and cities are not effectively planning for the threat of SLR. A recent article by Emily Dugdale in the San Francisco Public Press surveyed 13 cities and counties in the Bay Area to assess their SLR planning efforts. According to their findings, few counties and cities are effectively planning for SLR and limiting growth along the coast. Most of the participating cities and counties are studying SLR, but many of the proposed projects in the Bay Area do not incorporate the threat of a rising ocean nor are the projects required to be flood-proofed. Further, less than half of the cities and counties have completed vulnerability assessments in their coastal zones. The results of this survey revealed that there is a significant gap in public awareness of sea level rise and its impacts on vulnerable communities in the future. Of the 13 participants, only four – San Francisco, San Jose, Mountain View, and Santa Clara – have put significant effort into planning for SLR. The table below highlights the actions that Bay Area cities and counties are currently taking. Are We Prepared for Off-Shore Drilling in the Arctic? Because it’s coming. A recent Yale Environment 360 article highlights some genuine concerns about our lack of preparedness for off-shore drilling in the Arctic. 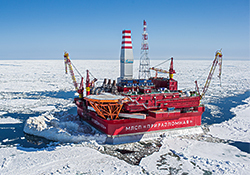 Russia, Canada, and the USA are making serious strides towards drilling in the Arctic but there are a number of concerns about whether countries and companies are ready to safely drill in the harsh environment of the Arctic. The article doesn’t touch much on the many issues that befell US attempts to conduct exploratory drilling in the Beaufort and Chukchi Seas in 2012. The drilling program ran into numerous problems, including the grounding of one of their drilling rigs on Sitkalidak Island – part of Kodiak Island and near to the Alaska Native village of Old Harbor where we have conducted fisheries research. The Department of the Interior released a report that reviewed Shell’s 2012 Oil and Gas Exploration Program and it was not pretty. An oil spill in the Arctic could have devastating consequences for marine life, fisheries, and Alaska Native communities that reside in the area. It doesn’t sound like we are near prepared to do it safely. Netflix Documentary Touts MPAs as the Marine Conservation Solution — What do you think? (1) Will a land-based model of conservation fully work for the fluid environment of the sea? Can MPAs help conserve fish, marine mammal, and shark populations that move long distances and easily cross boundaries? (2) The land model of conservation through protected areas has a troubled history of dispossession of Indigenous groups from their land, of disenfranchisement of locals from important livelihood activities, and of top-down implementation and management. How can we make sure that the ocean model doesn’t replicate those troubling patterns? We’ll have to see if the documentary addresses any of these questions when it comes out August 15th.